Well! With the advent of multiple new LCDs to test out, I decided to challenge myself to designing a 4×4 font, a pretty grim task if I’m honest. A 4×4 font with good byte packing could store the whole font set from character 32 to character 127 in 190 bytes. Note that for a standard 5×8 font, it would require 475 bytes! Whether or not this space saving is worth it for the increased complexity and pretty drastically reduced readability, is up to the designer of course. In this implementation, I’m not packing the bytes so it actually consumes 380 bytes. If looking at this from a space perspective, it most definitely isn’t worth it. Good job my camera is fine up close without a flash! Go Panasonic! 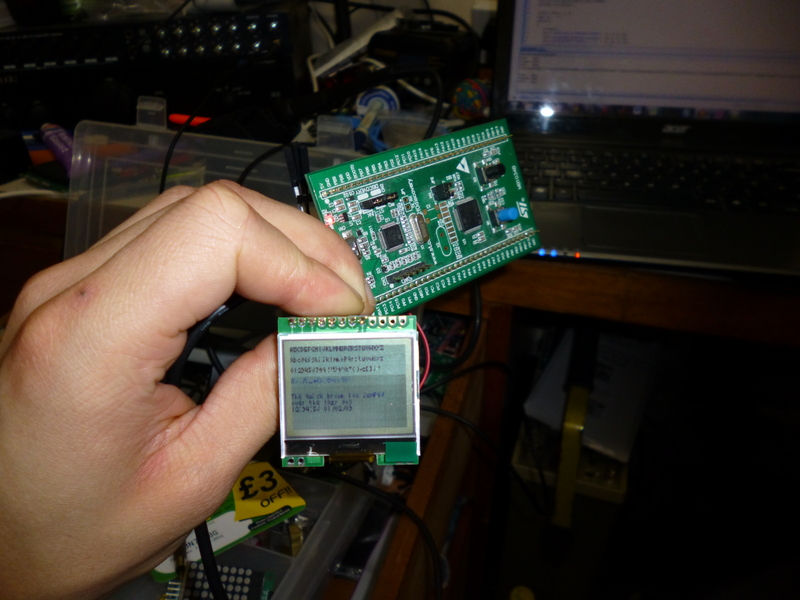 As you can see, its not the easiest of LCDs to read with this font size but it was a fun test! Some of the characters are a little dodgy to read too as making characters fit in a 4×4 font set ain’t easy! I’m sure it’d be much easier to read if everything was just written in upper case but who would want to do that anyway. For anybody interested in the actual font, it can be found here. The font was generated using the brilliant free program GLCD Font creator by MikroElectronika (http://www.pocketmt.com/index.php?target=downloads). After testing out my 100w LED with a poor boost converter designed around the 555 Timer, I decided to design a slightly better one around the not much better MC34063 IC. This IC pretty much does the same thing as my design by gating the clock. The LED current (represented as voltage due to a drop over a resistor) is used as the feedback and by varying the gain of this voltage drop, the LED current and therefore power can be modulated. To make the prototyping and testing easier, I’ve designed another PCB and its being manufactured by a UK milling firm for quick turn around! Pictures will be posted once they’re received. Today however, the inductor arrived and is a complete beast! Supporting up to 30A (the peak current required to drive the LED at 100w from a 7.4v LiPo battery), it is massive. Power electronics isn’t my forte… at all so if this project doesn’t work, atleast it will be a learning exercise for myself. 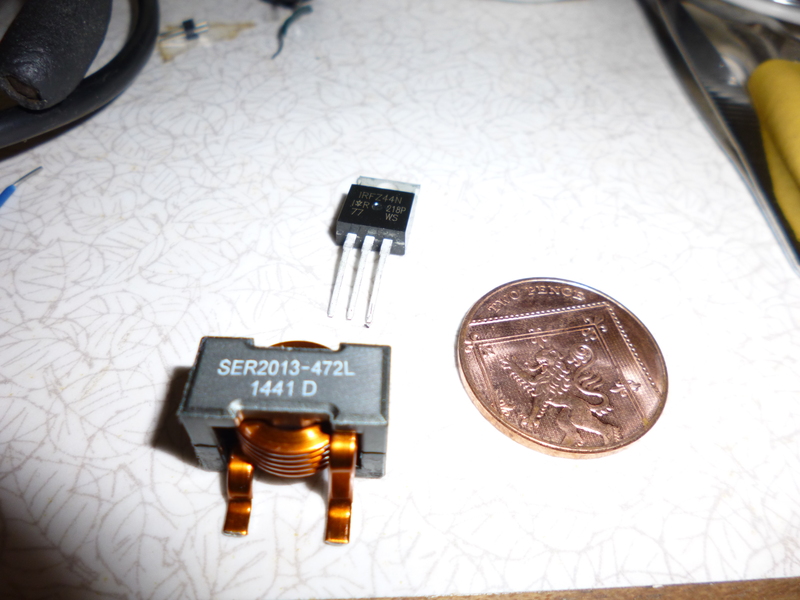 Along with my inductor also arrived the IRFZ44N Mosfets that I’ll be using for the switching. The inductor and Mosfet, 2p for size comparison! ← New oscilloscope and new LCDs and LED updates!